Even after being delivered, it was still hot. A significant improvement over my first McDelivery experience. Nice to see a promo box. If you are wondering where the review of the other items are, keep an eye out over the next couple days. Delivery receipts are itemised down to the spoon and sauce packets. 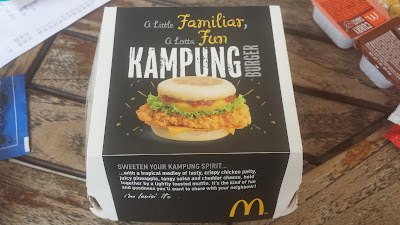 I heard about the Kampung (village) Burger launch a couple days ago because apparently about a week or so ago, McDonald's Singapore decided to invite bloggers to get an early taste of this new promo burger and give it a review. I would have loved to been invited just so I wouldn't have had to pay the obscene McDonald's Singapore prices, but after I saw a couple photos from the 'event' and it seems that the ONLY bloggers invited were Singaporean Chinese 'lifestyle' bloggers. I guess because I've given McDonald's Singapore food some pretty terrible reviews over the last year, they thought they couldn't trust me to give them a positive review (which it seems ALL the bloggers that were invited have done), but I guess at least this allows me to remain 100% impartial. Since my wife had dinner plans with one of her own blog friends this evening, I had planned to try the Kampung Burger on my own for dinner, but when I asked my colleagues if anyone wanted to try it with me later on, we decided to do McDelivery for lunch instead. I've only ordered McDelivery in Singapore once before, because I just can't justify the price. The food is 30% more expensive than in-store, but then they also tack on additional $3.50-4 delivery surcharge. 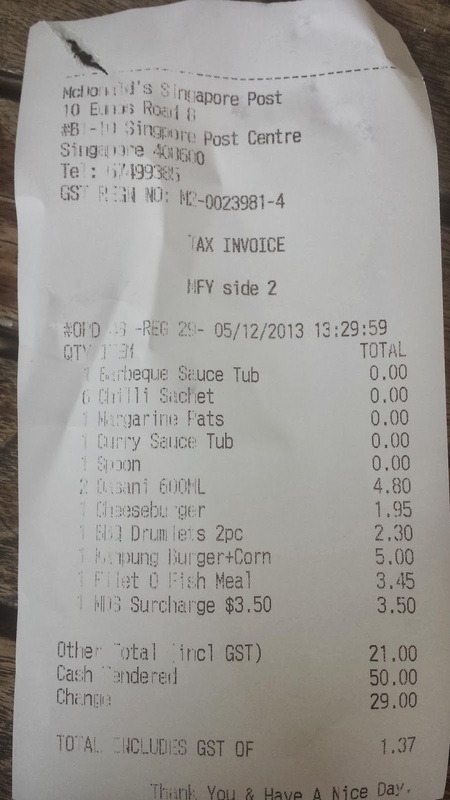 So my meal ended up costing me cost over $8 after it was all done and I suspect it would only be about $6.80 in store. 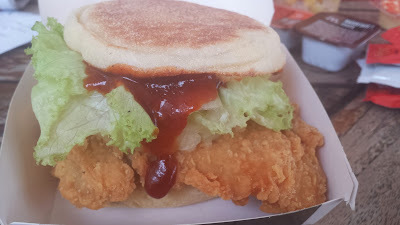 Since I'm not from Singapore, I never had the chance to try the original burger when it was for sale 15-20 years ago, so I can't compare it to the original, but what this burger is was a unseasoned Chicken thigh, topped with lettuce, cheese, salsa, pineapple on a McMuffin. This was the first time that I've had a McMuffin as a bun on a non-breakfast item, and I thought it worked well enough that it could be a nice change for future promos. 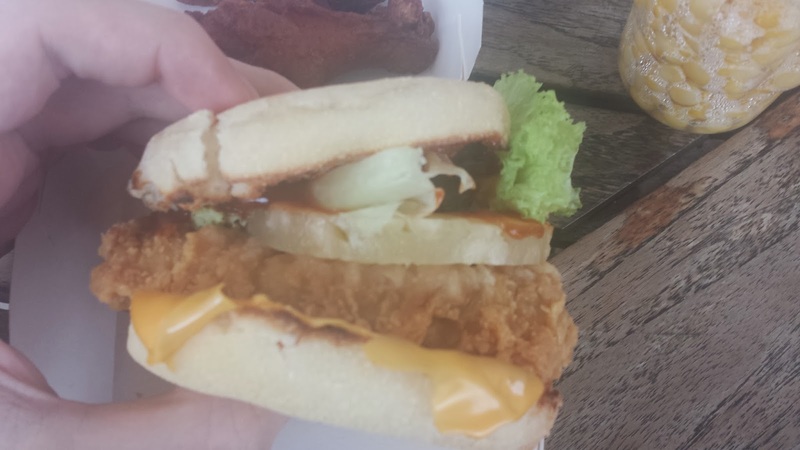 The downside was that it was a little too small for the large piece of chicken between it, in the future, it would be better if they made a larger Muffin used for their full size sandwiches. Before I ordered I was a little bit worried about the salsa, as I felt that it was going to make or break the taste in my opinion. I like my salsa spicy and chunky, and I assumed correctly that McDonald's was going to use a salsa which had the consistency of ketchup. Thankfully, it tasted better than I expected, it was distinctly salsa flavoured, but it was a little too tart, especially when there was slice of pineapple just below it. 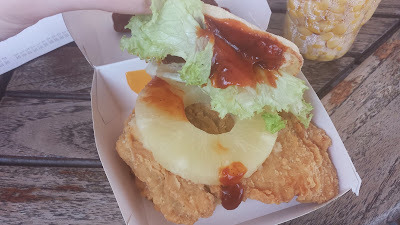 This wasn't the first time I've had salsa on a burger, nor was it the first time I've had Pineapple on a McDonald's burger before either. Once, I made my own as a part of the Singapore Blog Awards, to recreate the original Pineapple burger, and I have another review from a more recent Australian burger coming soon. 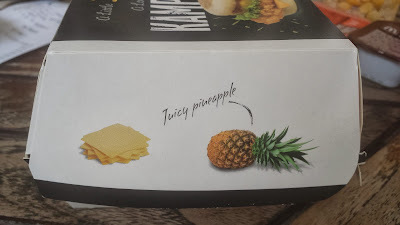 I'm not a huge pineapple fan, and this slice was nothing special. It wasn't sweet, and it was a bit too hard for my liking, I think it may had been soaked in syrup prior, and I felt it added nothing special to the burger, and I actually took half of it off. A decent amount of salsa, but you can see its consistancy. The small McMuffin bun is struggling to contain the ingredients. Apart from the special toppings and bun, the rest of the burger was pretty mediocre. 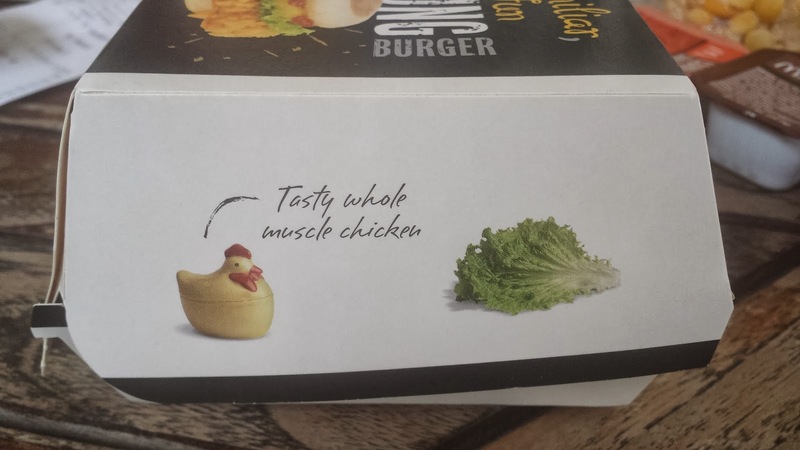 As I mentioned before, the chicken was large, but completely unseasoned, even using a McSpicy patty would have bumped it up quite a bit. The cheese was completely standard, but they actually used a whole leaf of lettuce, which is a first in Singapore I believe. All said, it's probably worth a try if you don't paying the premium over a standard burger, but I won't be ordering it again. 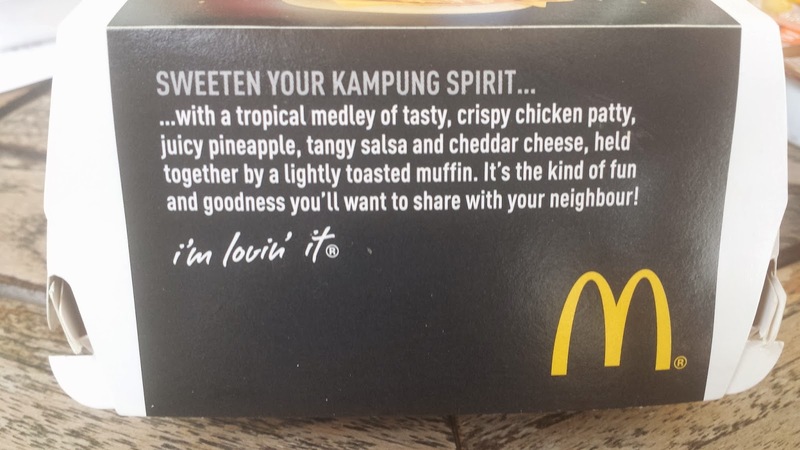 I appreciate you review, but exactly what is it about this burger that makes it kampong? 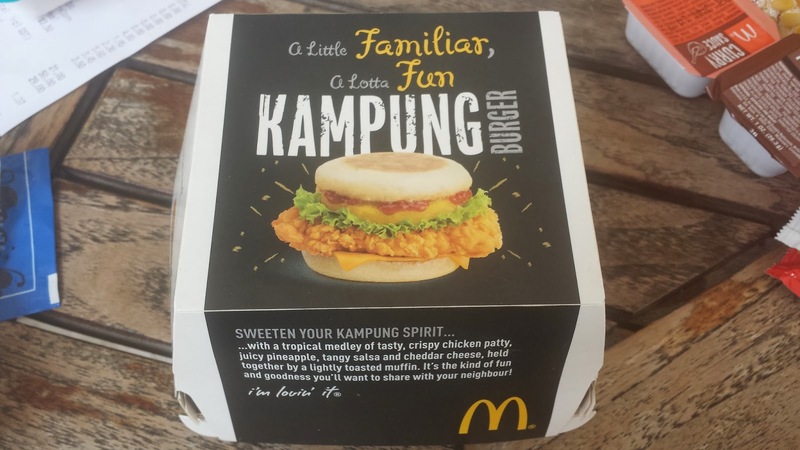 kampung chicken?